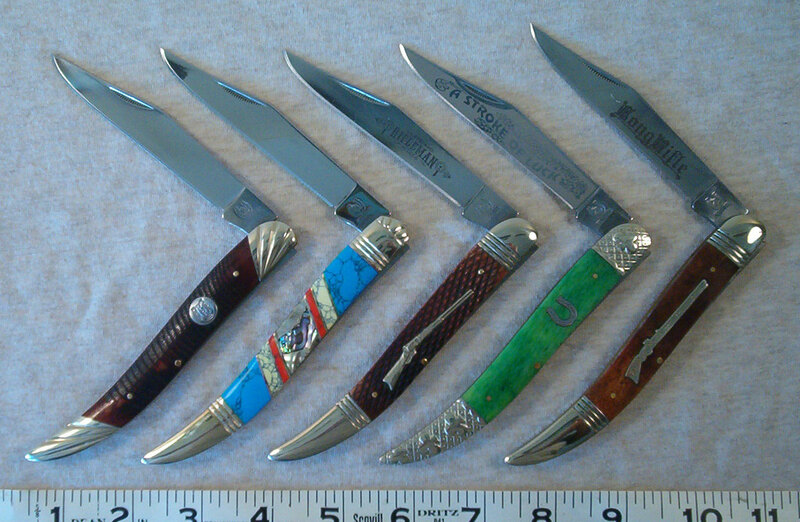 Currently Rough Rider offers five large toothpick knives. In most cases, each of the five knives is unique unto itself with different styles of bolsters, blade etches and handle materials. In every case, the large frame toothpicks are have been made as part of some other popular series of knives. Despite every knife having unique features, they are all based on the same frame and same style 4 inch clip blade. This frame and blade design is shared with SMKW’s Marbles Trademark line of large frame toothpicks. Raging Bull Knives, (a small independent importer) apparently had their large frame toothpicks made on the same frame, as well. As mentioned all the knives use a standard 4 inch clip blade in the same 5 inch frame. The blades open and close smoothly. There is no half stop and there is not a loud snap upon opening but they all open cleanly. RR are often said to be nailbreakers when opening. I should also note that because the blade is a standard clip in a toothpick frame, enough of the blade protrudes from the frame so that you can easily grip it between thumb and finger and pull it out without the use of the matchstrike nail-nick. In the case of all the toothpicks, the blade opens with a smooth easy pull. The blades will close with a loud snap, if you let them. They spring is such that the blade needs to be opened beyond 45 degrees to remain opened. A good choil prevents the blade's edge from making contact with the back spring upon closing; so there is no fear of the blade chipping or getting dull when you let it snap closed. All of the knives have brass liners and nickel silber bolsters. The long rifle and rifleman series share the same triple ringed bolsters. The other three knives have different style bolsters. The Stoneworx knive has nickel-silver channel inlays for the genuine and natural stones. All other knives have bone handles attached with brass pins. Shields, were applicable are nickel-silver. These are some of the best made large frame toothpicks around. Probably the one drawback, if you want to call it a drawback, is the use of the standard style clip blade over the more traditional California clip found on the knives made by Case, Queen, Bear & Son, etc. Which brings up a down side on the knives made by these American Companies (besides the much higher price): They lack any type of imagination when it comes to design. The bolsters are are down right bland. Admitedly, the American companies do sometimes use a better steel (Queen's D2, Case's CV, and Bear's Carbon Steel) but they also are just as likely to use a steel no better than RR's 440 Razor Sharp. As I mentioned the RR large toothpicks share a frame with those made by Marbles and Raging Bull. The principle difference between the knives is price and building materials. Marbles toothpicks cost on average about $8 more. The main differenc is you get the Marbles blade etch. The Marbles knives come in different colors of bone as well as an imitation tortoise shell They also normally come with a storage pouch. Raging Bull makes knives at a comparable price but scales tend to be made of colored plastic. The fit and finish is comparable but because they use cheaper material in their production you are paying about the same for plastic instead of bone handles. From what I've seen other global large frame toothpicks, tend to favor a slightly different frame and a cali-clip blade. This is espeically true of the Frost made and Taylor brand large toothpicks. Among Rough Rider collectors, the "Sawcut Bone" series is often consider one of the best. The fit and finsih of the entire series is absolutely phenomenol, especially for knives that can be purchased for under $15. The large toothpick is no exception. The brown bone is almost transluscent, and reminds me of real tortoise shell. The knives also have the older round RR horseshoe shield instead of the newer propellor shield making them slightly different. The fluted nickel-silver bolsters add a nice touch of class for the large toothpick. Shield: Round Rough Rider Horseshoe. Part of the Rifleman Series, this toothpick has chestnut bone handles featuring a checkerboard jig. The triple ringed nickel-silver bolsters are the sam eas those used on Marbles' and Raging Bull knives are are most likely the "standard" bolster for the 5 inch toothpicks made in the SMKW factory making Rough Rider knives. The shield on the knife is a 1873 Winchester lever action rifle. The knife features the "Rifleman" blade etch common to the series. Handle: Checkered "Gunstock" jigged chestnut bone. 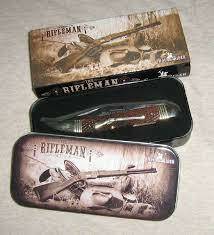 Packaging: The knife is shipped in a "Rifleman" tin which has includes a form fitting tray. The tin is wrapped in an open-ended Rifleman cardboard sleeve. The Rifle shown on the tin appears to be an 1892 Winchester. Following the success of the Rifleman Series, Rough rider came out with the Long Rifle Series. The series features smooth cheastnut brown bone handles with a Kentucky long rifle for the shield. The blade etch features the word "LongRifle" in "Old English" script. 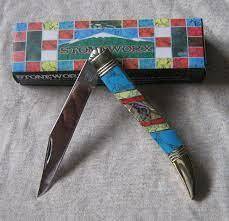 As with the Rifleman Series the knife was issued in a collector tin. The smooth bone on the knife is flawless. The pins and shield are flush with the bone. The knife features the same standard triple ringed nickel'silver bolsters. Handle: Smooth chestnut bone with a nickel-silver Kentucky Long Rifle shield. Blade: Long rifle Series etch. Packaging: The knife is shipped in a "Long Rifle " tin which has includes a form fitting tray. The tin is wrapped in an open-ended Long Rifle cardboard sleeve. The tin features a close up of Kentucky Long Rifle's lock mechanism. No doubt the main draw of the Stoneworx knives is their handle material. According to the box, the handles are made of natural material. This box is not 100% clear on what that means. To clarify, The handles are made with genuine pearl and abalone. The other stones are synthetic; which is not necessarily a bad thing. Synth-stones are laboratory made stones that are chemically identical to natural stones. Typically synth-stone is made from waste stone which is ground up and then through pressure or heat treating reformed into useable stone. It is often used in the jewelry industry. One major reason why it is becoming used more often is that it tends to be more stable as it has fewer impurities and imperfections than natural stone. And of course it also less expensive that natural stone. The blue stone in the handle is synthetic turquoise, the red and yellow stones are synthetic jasper. Hopefully this answers the most often asked question about the Stoneworx knives. As for the large toothpick, the stones arranged from top the bottom: Turquoise, yellow jasper, Bloody Basin red jasper*, abalone, Bloody Basin red jasper, yellow jasper, turquoise. As with all Stoneworx knives, nickel-silver is used for the channel inlay. The fit of the stones is superb. The bolsters are triple ringed nickel silver with the top bolster also being scalloped. Despite the lack of hammered detail on the bolsters, there can be little doubt that the Stoneworx knives are influenced by the beautiful knife creations of David and Brian Yellowhorse. The large toothpick is no exception. While the knife is priced low enough to be an everyday carry piece, it also looks impressive enough to be a show piece. This was one of my first Rough Rider knives, and since buying it, I’ve been addicted to the product. It is simply a fabulous piece of functional pocket jewelry. *Bloody Basin Red Jasper is a type of red Jasper found in Bloody Basin Arizona. It is a red stone with dark veins. While it is sometimes called "bloody jasper" this is a misnomer. Bloody jasper isa green stone with red viens running through it. 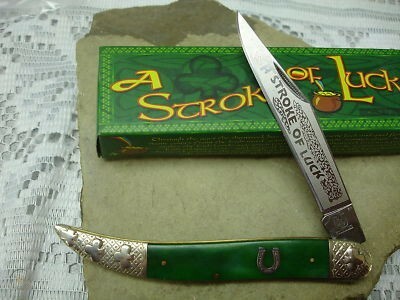 Probably my favorite among the 5 inch Toothpicks, the "A Stroke of Luck" features bolsters cast from a mold based on some old English bolsters found in the National Knife Museum at Smoky Mountain Knife works. The orginal bolsters were at least 80 years old, were cleaned up and pressed back into service. If this wasn't enough the blade etch is is done using the "Reverse Frosted" technique and finally, a special "horse shoe" shield was inlayed into the gren smooth bone. The top bolsters feature a three leaf clover or shamrock, The bottom bolster has three shamrocks. Behgind the shamrock is a diamond cast design. The blade etch is similar to the box art, which I beleive was done by Brian Wilhoite, one the premiere designers at Smoky Mountain Knife Works. Obverse blade marks: Tang: RR Horseshoe stamp:. Blade: Reverse Frosted, A Stroke of Luck etch.